The Main oeru.org website that lists available courses and qualifications. The Course website which contains all the learning materials. Interaction technologies used for communication and interaction among learners. The Course feed which brings together posts from learners using the various interaction technologies we use. a list of additional micro-courses associated with gaining transfer credit for the corresponding OERu full course. For example, Digital citizenship (LiDA102) is one of four micro-courses associated with the OERu’s Learning in a Digital Age course. The main oeru.org site also provides a list of the qualifications that can be earned by completing OERu courses. The url for the website is: https://oeru.org (bookmark this page). All OERu online course materials are “open access” and can be viewed on the respective course site without the need to register a password. The learning resources and materials for all OERu courses use the following standard website url: https://course.oeru.org/ with the course code appended at the end of the url. The easiest way to find OERu courses is from the course listing on the main oeru.org website. Once you have read what the course is about, you can scan the actual course materials before commencing your learning journey. When you have found a course you would like to study, follow the “start learning” link to access the materials on the course site and bookmark the page in your browser. 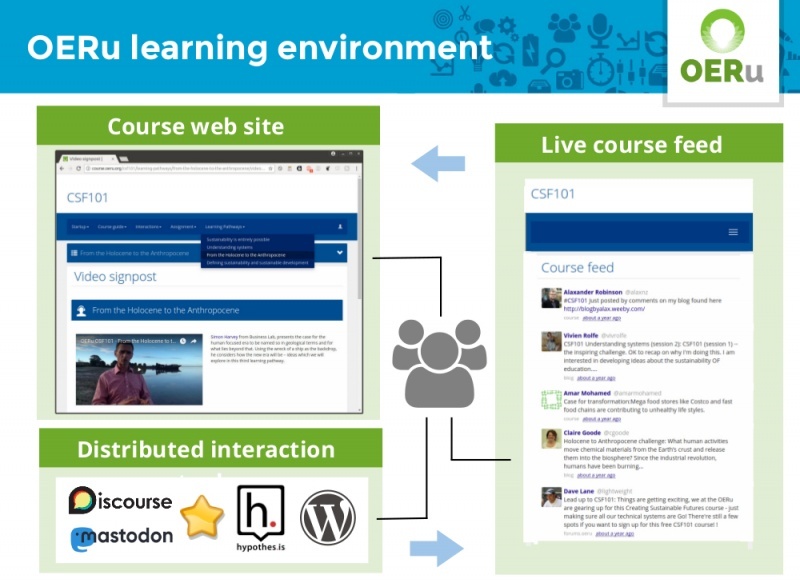 A key feature of the OERu learning environment is that learners retain control over all the content they create rather than enclosing contributions within a learning management system. You will retain access to the content you produce even after the course is finished. WEnotes (W iki E ducator notes) a technology developed by the OER Foundation to post comments on the course site and integrate these with the live course feed. Posts tagged with the OERu course code, e.g. #LiDA101, on these distributed interaction technologies are automatically collated and published on the live course feed. Thus, the course feed provides a stream of activity from your cohort on the course. The course feed is located under Interactions in the main course site menu. More information on how to use the course feed is available here. Follow the instructions below to find our courses or watch the video. In your browser go to our main page http://oeru.org. Click on “Courses” in the menu. In the Search field type in a word or phrase for courses you are interested in. Click on the title of the course that interests you. Click the “Register to Start Learning” button to go to the course website.